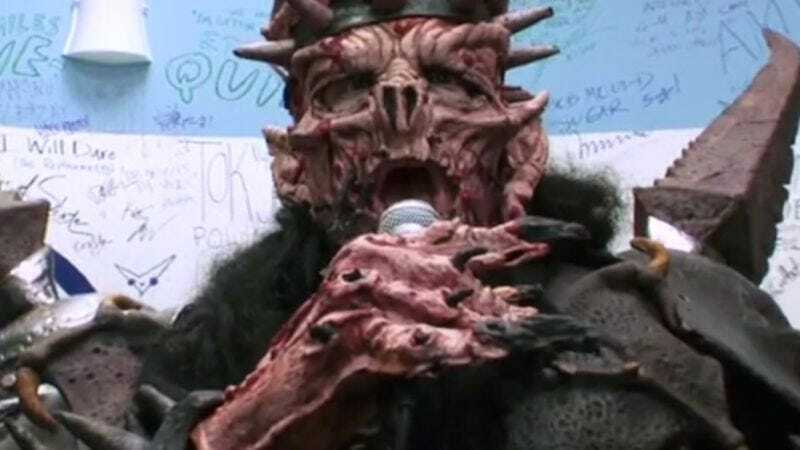 It’s been widely reported that Dave Brockie, known far better to fans as front-thing Oderus Urungus of GWAR, was found dead in his Virginia home yesterday evening. Brockie had been the leader and chief visionary of the theatrical metal band since its inception, 30 years ago. GWAR delighted rock fans and drama club enthusiasts alike, building a mythology around himself and a rotating cast of bandmates with elaborate costumes and names to match. Nobody left a GWAR concert unchanged, and that change often manifested itself in physical filth—audiences were sprayed with fake blood and other bodily fluids, much to their delight. Brockie was the last founding member of GWAR, and presumably the band will die with him. (Expect the tributes that will surely pop up soon to be mighty, though.) TMZ—so take this for what it’s worth—is reporting that Brockie’s death was not a suicide, that no note was found, and that there were no drugs in the house. Brockie was only 50.